The Orion Bullets Image Credit: GeMS/GSAOI Team, Gemini Observatory, AURA Processing: Rodrigo Carrasco (Gemini Obs. ), Travis Rector (Univ. Alaska Anchorage). 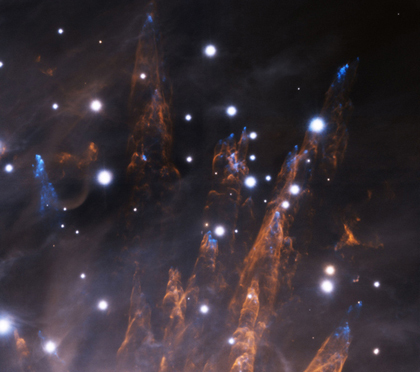 Shock waves stream back around objects in a star-forming region. Computational modeling of hydrodynamic astrophysical systems is a ground-up approach to understanding the fundamental nature of fluids and the inherent behavior of astrophysical systems such as protostellar and protoplanetary disks. Theoretical research in this area began in the 1980’s with modeling of very simple systems. It was predicted that gravitational instabilities would produce internal structure in star-disk systems. Today, we have very highly evolved computational systems which allow us to carry out high-powered simulations of hydrodynamic structures. It is only in the last few years that observation of star-disk systems has borne out the work of the theorists in this regime. Recent advances in observational techniques have, for the first time, allowed us to see that protostellar disks contain internal structure, reminiscent of spiral arms seen in spiral galaxies. Our modeling method for star-disk systems involves using an equilibrium model as an initial condition for the time-evolving model. We calculate the equilibrium disk structure by solving conservation equations on a computational grid, using an initial guess for the mass density and angular momentum structure. We use an independent relationship between enthalpy and density to compare the result to a previously defined tolerance. If the tolerance is not met, we improve the guess and reiterate until the tolerance is met. We then linearly perturb the equations and solve them on a cylindrical grid. Each solution of the equations serves as the initial condition for the next time step. We monitor the growth of the perturbed density until it has either settled into exponential growth (unstable) or a sufficient amount of time has elapsed to declare the model stable. We have developed an array of analysis tools useful in determining the properties of the unstable models. We see that the geometry of the disk and the relative mass of the central star to the disk produces various kinds of modes in the disk. For systems where the disk mass is much greater than the mass of the star, and inner edge of the disk is far removed from the star, the self-gravity of the disk is the dominating mechanism and J modes arise in the disk (named after the Jeans instability). In systems where the star mass dominated, we see P modes and edge modes, depending on how far the inner edge of the disk lies from the star. Intermediate I modes arise where the self-gravity of the disk and the pressure support are comparable. Our nonlinear approach uses the same equilibrium models as initial conditions, but solves the system of equations by fluxing mass and angular momentum in the grid. This approach is much more computationally expensive than the linear modeling, and it gives more information about the development of the systems, as it includes higher order coupling between the modes and evolves all of the modes simultaneously. The nonlinear code we employ is an adaptation of the Chymera code, which is fully parallelized and includes several subroutines devoted to realistic equations of state and radiative cooling. Chymera is second-order in space and time and includes artificial viscosity, enabling the correct handling of hydrodynamic shocks. The richness of the dual approach of combining linear and nonlinear calculations is that the linear models allow an extensive sampling of parameter space, indicating regions of interest in which to focus nonlinear investigation. Linear models also give a check for early behavior of the nonlinear models. The linear results allow us to perform a quasi-linear analysis, which is predictive of the nonlinear development. Understanding the underlying reasons for the behavior of these systems is fundamental to this research. One of the main issues we address is how the bulk of the available mass in the system ends up in the star, while the early central object is relatively low in mass, compared to the disk. We focus on understanding how mechanisms of angular momentum transport arise, and how various kinds of modes inherent in the disks are driven. We are working on advancing the physics of the models by including radiative cooling and complicated equations of state, including molecular hydrogen and dust. Our recent progress has been very promising, seeing that the formation of clumps of material can arise as a result of radiative cooling. Clumps like these may precede the formation of Jovian planets. Typical models in this field include the star as a point mass. Very little work has been done where the star is included as a resolved object in the grid. Our recent work has shown that inclusion of the star in this manner is important. Modes of oscillation in the star itself can gravitationally couple to the disk, changing the evolution of the system. I am currently conducting simulations in both the linear and nonlinear regimes of systems including a resolved star. Nonlinear models are very computationally expensive in that very high resolution of the grid must be maintained in order to correctly model the modes internal to the star. My work is fundamental at the moment, excluding cooling. I intend to add more complicated equations of state and radiative cooling to my models. This methodology will shed light on many systems, such as first stars (those formed early in the universe) and protostellar and protoplanetary systems. Another application of this method would be to model star-disk systems where the star is a white dwarf or a neutron star. Equations of state for systems like this are readily available, and can be included in our intact code in tabular form.